Whether you own a Samsung Galaxy S7 Edge, Tecno Camon C9, LG G Pad II 10.1, Nexus 6P or Infinix Hot 3, there a several reasons to root Android smartphone. We have already discussed how to jailbreak and gain root permission on iPhones, iPad and iTouch devices. Android is open source making it the most customizable mobile Operating System available. But you can gain even more control by rooting your phone or tablet. Today, we share with you at 11 top reasons to root Android phone or Tablet, but as always, we must remind you that rooting does come with some risks. But it’s not that risky. And if you want to really unlock the full potential of your device—if you want to be able to control everything, backup everything, customize everything, and do all sorts of fun things like install custom ROMs and get Android Nougat ahead of the pack—you’ll need to root your Android smartphone. Maybe i need to remind you that you own your device, and you should be able to do with it as you please. Certain manufacturers and carriers try to keep that from happening, but with root access, you truly own your device and open yourself up to all the possibilities other parties try to block. Sometimes, you will like to install some apps from playstore that offers promising features – from fixing elements of your phone’s performance, to adding new features- but a closer look at the requirements, you’ll see the legendary ‘Root Access Required’ or some such similar condition. Luckily, rooting can help get these interesting features. Whatever you want, root access gives you the power to do a lot more. Mostly the restriction is due to the app being able to change the deeper system settings. Powerful root-only apps like Tasker can turn your dream of a super-smartphone into a reality. Tasker uses the “if this, then that” mentality to make your phone a genius. We of all people understand that you need to make money with occasional ads but ads can also get in the way and use up data. If you want to block ads in certain apps or on certain devices, rooting is by far the best way to do so. AdFree, AdBlock Plus, and Ad Away are all great options. Of course, if you aren’t rooted, going into airplane mode can do the magic too. Every Android device has the ability to make a backup of applications and certain data, within the settings menu or through the use of management software like Samsung’s Kies. Even if you decide to use these options together with various cloud services, nothing can ultimately compete with the features offered by root permission backups. For example, it is only with root that you can use the legendary app Titanium Backup or lay hold on Flashify, with which you can make copies of the entire system image of your device and move it to your SD card or computer. You also have the the ability to automate the process at regular intervals. Titanium Backup is good for more than just backups, too. It can also uninstall that annoying, battery-draining, space-wasting bloatware that comes pre-installed on so many phones these days but you need to root to enjoy this feature. Freeze them first to make sure your phone operates normally without them, then delete them completely to free up that space. You’ll be glad you did. Now, it’s fair to say that this feature isn’t as critical as it once was, mainly due to the fact that many newer handsets are phasing out SD card capabilities. If you have one that does allow expandable storage though, then being able to move apps onto the SD and save space on the inbuilt storage could well make it worth Rooting the device. Use a root-only app like FolderMount to store apps, not just files, on your microSD card. Now your device has infinite (read: 128GB) of real usable storage! If you’re the kind of person that likes to fiddle with every little feature—both on the surface and under the hood—rooting is for you. Whether you want to get the latest Android features or using features such as tethering to share and connect phones via USB, Bluetooth and Wi-Fi, rooting gives you the power to access just about any feature from other phones you can think of. If you want to do it, chances are someone over on a forum like XDA has created a mini-app or tweak that will help. This is the number one reason why the majority of Android users decide to get root permissions. In addition to radically (or subtly) customizing a smartphone, the major custom ROMs we like the most tend to outdo the stock ROM in terms of functionality, performance and fluidity. Another important feature is the ability to upgrade our old and manufacturer-abandoned smartphone with the latest versions of Android. The best thing about rooting is that if at any time you decide you’d prefer to go on as before, before you got root permission, you can unroot in a snap. This means you can return to the original firmware of your device and, in most cases, also restore your warranty (with a little smoke and mirrors). All of this can be achieved through the use of a special tool kit or just by reflashing the original firmware with Odin, SP Flash Tool or another flash tool. So that completes the the 11 handpicked reasons to root Android! 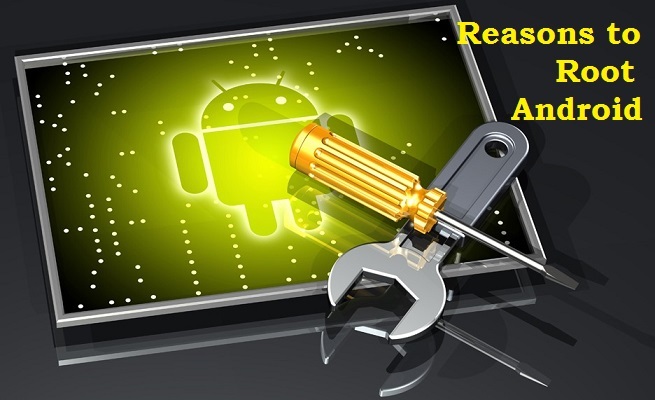 If these reasons have convinced you that root is for you, why not go ahead to root your Android phone right now?